Jane and I were born in the same small New Jersey hospital just days apart. We both were high school athletes growing up just miles away from each other; we attended the same college; but, we did not know each other until we started fencing in our early forties. We shared the same enthusiasm and joy of competition. Even when fencing against one another, the joy of competing was more important than the outcome. However, Jane was more skilled than I. 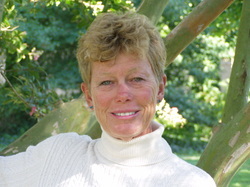 On Jane’s 50th birthday she won her first of more than 22 National Fencing Championships. I went surfing on mine! Not only is Jane an accomplished artist and illustrator, in 2005 she won the World Championship for Veteran’s Women’s Sabre. 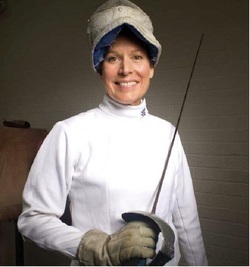 She still is competing and is rated as one of the top Veteran Women’s Sabre fencers in the world. Ever since I was a young girl I have been active. Competing in high school, club, college and/or nationally in field hockey, lacrosse and fencing. I have surfed, skied, played water polo, dabbled in most sports and have even tried street luging while attending a workshop at the Lake Placid Olympic Training Center. I always have attended seminars, conferences, and workshops pertaining to sports, physical fitness, sports medicine, personal training, and/or sport safety gaining knowledge and discovering different techniques to get and stay fit. I was a Physical Education teacher for 30 years and have seen the physical conditioning of our children steadily decline. I realized something should be done but knew if it was not fun, it would not work. With these experiences, my years of education, and being a Personal Trainer I have written this book with hope it will help to keep both you and your children fit as well as build a stronger bond that comes with being active together.